A - Pours a dark mahogany-red with a finger of frothy off-white head. The head fades down at a normal pace leaving behind only a touch of lace. S - Aroma is a mix of raisin and other sweet dark fruits, coriander, kaffir lime, and lemongrass. There is also some Belgian yeast with some residual and candi sugar and a bit of booze. T - Starts off with some sweet dark fruits with some raisins with some coriander, kaffir lime, lemongrass, and Belgian yeast. Through the middle, some candi and residual sugars come through with some more spice and a bit of pepper. The finish is a mix of sweet dark fruits and caramel malts with some spice, Belgian yeast, and a bit of booze. M - Medium-full bodied with moderate carbonation. Feels smooth with a sweet and warming finish. D - Very drinkable. Nice balance of dark sweet flavors, spices, and body. I like the lemongrass and the kaffir lime. Siamese Twin has a face that even a mother would have a hard time loving. U-G-L-Y, this thing could have Johnnie Cochran argue its alibi and it wouldn't matter - it's ugly. Murky, extremely muddied clay tones gives it a swampy - or worse, sewage-y - appearance. The absence of any foam is unattractive and completely unsuitable for the style (conventional or not). The first sip reveals a familiar profile: a complex maltiness with notes of caramel, toast, prunes, raisins and a drop of rose-scented perfume. Maybe a trace of mushed bananas too. But closer inspection gradually exposes the other ingredients; flashes of middle-eastern spice, citrus and green herbs round out most sips, albeit more subtly than expected. It's obvious Asian ingredients would add uniqueness, the real question was whether they'd suit the sweet, fruity flavours of a Dubbel. I have to say: yes! In fact, I think this recipe is rather genius; just imagining all the possible food pairings requires a calculator. The beer's real (and only) fault is its lack of body; without a rich malt bill this tastes too much like prune juice. Uncommon Brewers is right! This is a terribly interesting take on a classic Belgian style. Who knows how the monks would feel about this twist, but I say "Hear! Hear!". 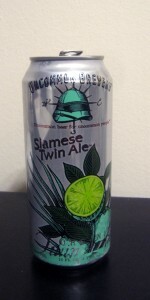 Though far from an outstanding offering, in many ways Siamese Twin represents all that is great about American craft beer: creativity, innovation, reinterpretation, distinctness. And this one's organic too. Poured slowly into a Bruery tulip. This beer is a muddy brown and seems to be quite thick. The smell when I opened the can was a bit worrying. I got a whiff of rusty metal and old beer. Upon properly smelling the beer I get definite hints of ginger and lemongrass mixed with the sweet and alcohol qualities of a dubbel. None of the smells stand out though and if I were to blind taste this beer I would be wary of how it tasted after smelling it. Not much to taste on the front but after that the beer washes over your mouth coating it with a bitter sweetness with perhaps just a bit of ginger spiciness. Aftertaste is plain and malty. I taste absolutely no Belgian yeast in this. I'm pretty disappointed in this beer. I was excited when I found a store selling single cans of it because I was unwilling to buy a 4-pack of it where I normally buy all my beer. Beer pours a DEEP translucent ruby with a dark tan head that dissipates very quickly. I get toffee, burnt sugar, slightest bit of coffee, dark fruit and caramel apple on the nose. Taste is a ton of toffee up front and through the finish. Lots of brown sugar. Lots of caramel. muted alcohol heat. The spices come through in the finish. Mouthfeel is quite full, slightly syrupy on the finish. Overall, not my cup of tea. The weird spices seem to be fighting with the toffee sweetness of the ale as opposed to complementing it. Age might mellow these flavors out and produce quite a unique beer. Pours nice and toasted brown with some central light etching. Smells of lime, some sweet syrups, a little bit of belgian yeasts, some coriander, and the lemon grass. Taste is lightly tart, some alcohol, some bitterness, some candy. Medium on full body with hi carb and a semi dry finish. Not a good beer really. APPEARANCE: This beer, poured from a tap into a goblet, produced a medium-tan frothy 1" head that dissipated somewhat slowly leaving good head lacing. Carbonation was soft in a muddy deep amber body. AROMA: Some sweet malts but the predominant aroma was of lemon and ginger and a bit of alcohol. TASTE: Initially, moderate amounts of lemon, lime, mint and grass, a hint of yeast, a bit of sweet malt and a bit of warm alcohol. MOUTHFEEL: This beer had a somewhat light body with a thin texture, soft carbonation and modest body lacing that dissipated somewhat slowly. The initial flavor was moderately tart and bitter with a somewhat sweet finish that lasted for a moderate length of time. DRINKABILITY: This is a sipping beer, not one I'd want for a session beer. Two would be tops for me. While easy to drink and having a good price point, the beer suffered from some deficiencies, not least of which was that it didn't taste much like a dubbel. It's described as "unique and uncommon," and I'll give them that -- and points for creating an original brew -- but I doubt that I'll buy it again; it just wasn't that outstanding. Uncommon must have saved all of the foam that everyone else is looking for and put it in my can, as an uncontrollable head left a bright ruby clear beer with lots of bubbles. No idea how old this one is, no visible canning date. Smells interesting and Belgian... like opening up your spice cabinet and taking a whiff. Tastes bounce around from the traditional dubbel to all sorts of strange but pleasant herbal overtones... cinnamon, raisins, autumnal leaves. Oh, and the alcohol rears its ugly head as well (maybe this reduces with aging?). Crazy beer worth a try, especially if you like picking out spices and like the "Belgian malt liquor" vibes.